The Bellevue-Stratford Hotel, site of the first known outbreak of Legionnaires' disease. The hotel closed in November, 1976, four months after the outbreak. The 1976 Legionnaires disease outbreak, occurring in the late summer in Philadelphia, Pennsylvania, was the first occasion in which a cluster of a particular type of pneumonia cases were determined to be caused by the Legionella pneumophila bacteria. Previous outbreaks were retroactively diagnosed as being most probably caused by Legionella bacteria. On July 21, 1976, the American Legion opened its annual three-day convention at the Bellevue-Stratford Hotel in Philadelphia, Pennsylvania. More than 2,000 Legionnaires, mostly men, attended the convention. The date and city were chosen to coincide with America’s celebration of the 200th anniversary of the signing of the US Declaration of Independence at Philadelphia in 1776. On July 27, three days after the convention ended, Legionnaire Ray Brennan, a 61-year-old retired US Air Force captain and an American Legion bookkeeper, died at his home of an apparent heart attack. Brennan had returned home from the convention on the evening of July 24 complaining of feeling tired. On July 30, another Legionnaire, Frank Aveni, aged 60, also died of an apparent heart attack, as did three other Legionnaires. All of them had been convention attendees. Twenty-four hours later, on August 1, six more Legionnaires died. They ranged in age from 39 to 82, and, like Ray Brennan, Frank Aveni, and the three other Legionnaires, all had complained of tiredness, chest pains, lung congestion, and fever. Three of the Legionnaires had been patients of Ernest Campbell, a physician in Bloomsburg, Pennsylvania, who noticed that all three men had been at the Legionnaires convention in Philadelphia. He contacted the Pennsylvania Department of Health. Officials at the American Legion also began getting notices of the sudden deaths of several members, all at the same time. Within a week, more than 130 people, mostly men, had been hospitalized, and 25 had died. Both the first week and later, there were 149 Legionnaires who became sick and 33 other persons associated with the hotel or in the area who also became sick. Of these total of 182 cases, 29 persons died. The U.S. Centers for Disease Control and Prevention mounted an unprecedented investigation and, by September, the focus had shifted from outside causes, such as a disease carrier, to the hotel environment itself. In January 1977, the Legionella bacterium was finally identified and isolated and was found to be breeding in the cooling tower of the hotel’s air conditioning system, which then spread it through the building. This finding prompted new regulations worldwide for climate control systems. Complicating the situation was a fear among the public that the original cluster of 14 cases, six of whom died within a few days of each other, represented an outbreak of swine flu. The total number of cases reached 211, and of those, 29 had died. At the time of the outbreak, epidemiological investigation protocols did not include active participation by both the laboratory specialists and investigators. No effective communication existed between scientists in the field interviewing patients, and those in the laboratory testing specimens. While the Center for Disease Control responded rapidly, as did the Pennsylvania Health Department, it took six months for the CDC microbiologist Joseph McDade to discover the cause of the outbreak. He initially thought the cause was viral because blood and tissues from the victims failed to grow bacteria when incubated in culture medium. His subsequent attempts to isolate the viral agent in eggs included antibiotics to kill off "contaminating" bacteria. It was only when he omitted the antibiotics that the bacteria grew in eggs. Attempts to reproduce the disease in mice, the standard laboratory animal model, also failed. The disease was finally produced in guinea pigs. The CDC announced the discovery at a press conference on January 18, 1977. The bacterium was later named Legionella pneumophila. Legionella pneumophila is the most common cause, but sometimes other species of Legionella bacteria also cause Legionnaires' disease. The terms "Philadelphia fever" and "Legion fever" appear to have been used at the time of the outbreak and for shortly thereafter, although at least one 2008 source which covers disease in a historical narrative sense also included "Legion Fever" as alternate name. Both the World Health Organization in 2018 and the United States Center for Disease Control and Prevention (CDC) in 2017 only use the term Legionnaires' disease to refer to the serious version with pneumonia. CDC investigators quickly discovered outbreaks of respiratory disease caused by L. pneumophila dating back to 1959. An outbreak of what was dubbed Pontiac fever occurred in a health department in Pontiac, Michigan in July 1967. No one died. Although caused by the same bacterium, Pontiac fever is a milder ailment than Legionnaires' disease. Pneumonia is absent in those with Pontiac fever. An outbreak of pneumonia in July–August, 1965, at St. Elizabeths Hospital in Washington, DC, which killed 16 persons out of 78 infected was later determined to be Legionnaires' disease. 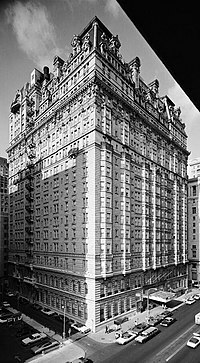 A September 1974 convention of the Independent Order of Odd Fellows was also held at the Bellevue-Stratford Hotel. Out of approximately 1,500 members who attended, 20 developed pneumonia and two died. A later article in The Lancet reported: "Illness [high fever and pneumonia] was significantly associated with attendance at one convention activity held on Monday morning, September 16, 1974, in the grand ballroom of the hotel." ^ a b c Klaus Heuner; Michele Swanson, eds. (2008). "Ch. 1: Legionnaires' Disease: History and Clinical Findings". Legionella: Molecular Microbiology. Norfolk, UK: Caister Academic Press. pp. 3–4. ISBN 978-1-904455-26-4. ^ a b c Harold M. Schmeck, Jr. (January 19, 1982). "LEGIONNAIRE'S DISEASE: 5 YEARS LATER THE MYSTERY IS ALL BUT GONE". The New York Times. ^ a b Terranova, William; Cohen, Mitchell L; Fraser, David W (1978). "1974 outbreak of Legionnaires' Disease diagnosed in 1977. Clinical and epidemiological features". The Lancet. Elsevier BV. 312 (8081): 122–124. doi:10.1016/s0140-6736(78)91507-6. ISSN 0140-6736. PMID 78324. ^ a b c "The Philadelphia Killer". Time. August 16, 1976. ^ a b Fraser, David W.; Tsai, Theodore R.; Orenstein, Walter; Parkin, William E.; Beecham, H. James; Sharrar, Robert G.; Harris, John; Mallison, George F.; Martin, Stanley M.; McDade, Joseph E.; Shepard, Charles C.; Brachman, Philip S.; et al. (December 1, 1977). "Legionnaires' Disease — Description of an Epidemic of Pneumonia". New England Journal of Medicine. 297 (22): 1189–97. doi:10.1056/NEJM197712012972201. PMID 335244. ^ "Spread by airborne droplets? Legionnaire's disease linked to water". The Globe and Mail. September 4, 1978. p. 10. Retrieved January 18, 2014 – via The New York Times Service. ^ Lawrence K Altman (August 1, 2006). "In Philadelphia 30 Years Ago, an Eruption of Illness and Fear". The New York Times. Retrieved 2011-10-08. By early August, news organizations across the country were reporting that 6 to 14 of the men in Pennsylvania had died. ^ "Legionnaire disease". Encyclopædia Britannica. Retrieved May 10, 2016. ^ Hoge, Charles W.; Breiman, Robert F. (1991). "Advances in the epidemiology and control of Legionella infections". Epidemiologic Reviews. 13: 329–40. doi:10.1093/oxfordjournals.epirev.a036076. PMID 1765117. ^ Garrett, Laurie (1995). The Coming Plague: Newly Emerging Diseases in a World Out of Balance. Toronto; New York: Penguin Books. pp. 184–186. ISBN 0140250913. ^ McDade, Joseph E.; Brenner, Don J.; Bozeman, F. Marilyn (1979). "Legionnaires' disease bacterium isolated in 1947". Annals of Internal Medicine. 90 (4): 659–61. doi:10.7326/0003-4819-90-4-659. PMID 373548. ^ McDade, Joseph E.; Shepard, Charles C.; Fraser, David W.; Tsai, Theodore R.; Redus, Martha A.; Dowdle, Walter R. (1977). "Legionnaires' Disease — Isolation of a Bacterium and Demonstration of Its Role in Other Respiratory Disease". New England Journal of Medicine. 297 (22): 1197–203. doi:10.1056/NEJM197712012972202. PMID 335245. ^ a b c "Legionellosis". World Health Organization (WHO). 2018. ^ a b c Preeta K. Kutty; Laurel E. Garrison (May 31, 2017). "Legionellosis (Legionnaires' Disease & Pontiac Fever)". U.S. CDC. ^ a b B. D. Colen (January 31, 1977). "'Legion Fever' Germ Killed 16 Here in 1965". Washington Post. ^ George C. Kohn (2007). Encyclopedia of Plague and Pestilence: From Ancient Times to the Present (3rd ed.). New York, NY: Facts on File, Inc. (InfoBase Publishing). p. 303. ISBN 978-1-4381-2923-5. ^ Winn WC (January 1988). "Legionnaires disease: historical perspective". Clin. Microbiol. Rev. 1 (1): 60–81. PMC 358030. PMID 3060246. This page was last edited on 30 November 2018, at 22:24 (UTC).